I spent the morning of September 11th this year in Denver International Airport. I had two flights that day (kind of my own personal F.U. to the terrorists) and the early departure time had me sitting in the waiting area when the airport called for a minute of silence to honor the memory of those lost on 9/11. While I'm sure the attacks affected everyone 10 years ago, I imagine that they struck very close for those who work in the airports. All activity in the airport stopped, and everyone bowed their heads to remember. There was a lady waiting for a flight one gate over who just kept talking. Didn't lower her voice or anything. Now I'll grant you that it was an important conversation...apparently the security checkpoint had asked her to remove her shoes but allowed the four year old in front of her to keep theirs on. Obviously she had been hugely wronged, and the injustice of the situation took precedence over the fact that the couple she was talking to were trying to observe the moment of silence. Now I've been known to pay less than the appropriate amount of attention to things on the rare occasion. My kids will talk to me about things I'm not interested in or don't understand [I'm not sure where that transition took place. It went from Barney (don't care) to the Teletubies (still don't care) to Dora (not caring) to the slower frame rate on the new moderation packs for the Beta test of Minecraft (huh?)] and while I try to be a good Dad and listen, it's hard when your 10 year old is talking above your head. Of course I can't blame everything on not understanding. My Mom, my wife, and Mrs. Madison my 10th grade math teacher, will all tell you that sometimes I just don't stay focused. 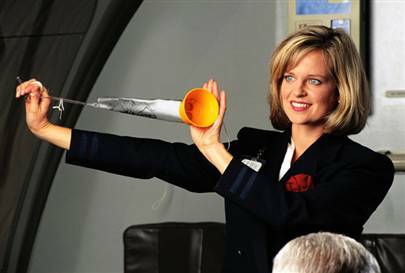 The one I struggle with the most though, is the safety briefing that flight attendants have to give before a plane can take off. I understand that they have to do it, and judging from their faces it can't be their favorite part of the trip, but really it shouldn't be that hard to pay attention to somebody for 60 seconds. Every time though, it's the same thing. I put down my book and try to focus on the person doing the demonstration, but about 15 seconds in my eyes start to get heavy and my head starts to bob. At about the 30 second mark they do the seat belt click, and usually that jolts me back to consciousness where hopefully I can stay until the presentation is finished. I tell my kids that it's polite to pay attention to the people doing these presentations, but I wonder if the flight attendants prefer to look out and see the 95% of the passengers who couldn't be bothered to stop what they're doing, or the guy who put everything down to watch but then couldn't stay awake through the demo. I'll admit that it really annoyed me to hear the lady talking through the minute of silence in Denver, but while I would have liked to go over and tell her to keep quiet, Matthew 7:5 certainly applies here. I simply did my best to remember in my own way, and who knows? Perhaps in 10 years I'll find myself back at Denver and there will be two minutes of silence; One for the victims of 9/11, and one for the lady who had to take her shoes off at security. #2. hmmm, I had a point to make here but my mind seems to have wondered off somewhere. I still don't know how to play bridge. What? LOL...Ahhh I see the Mrs. Madison fan club is alive and well. She was one strict, old school teacher, but I'm sure there were some benefits from having her as a teacher. For instance, I still don't know how to play Bridge either. I should thank her for that. This is What Frequent Flyers Want? It's Over? I'm Going to Bed!!! StarMegaDo3 Continues! Charter Flight to Denver. What I Learned at the Campground Today.